Railpictures.ca - James Knott Photo: With GEXR starting each morning in Stratford and heading west from there, you need to start to think a little outside the box for shots as most everything will be back lit. For most of the morning, it was clouded over and there were no issues (at least with respect to back lighting). But as GEXR 581 neared Seaforth, the sun started to peak through the sky. A little unsure what to do, and with the train nearing, I figured I’d at least try for something interesting so I put the wide angle lens on and scampered to the south side of the crossing. I am quite grateful the sun did come out for a bit, as it allowed for a nice shot at the Port of Goderich where they shoved one car down to the Port, which can be viewed here (along with a description of the day’s operations). | Railpictures.ca – Canadian Railway Photography – photographie ferroviaire Canadienne. Copyright Notice: This image ©James Knott all rights reserved. Caption: With GEXR starting each morning in Stratford and heading west from there, you need to start to think a little outside the box for shots as most everything will be back lit. For most of the morning, it was clouded over and there were no issues (at least with respect to back lighting). But as GEXR 581 neared Seaforth, the sun started to peak through the sky. 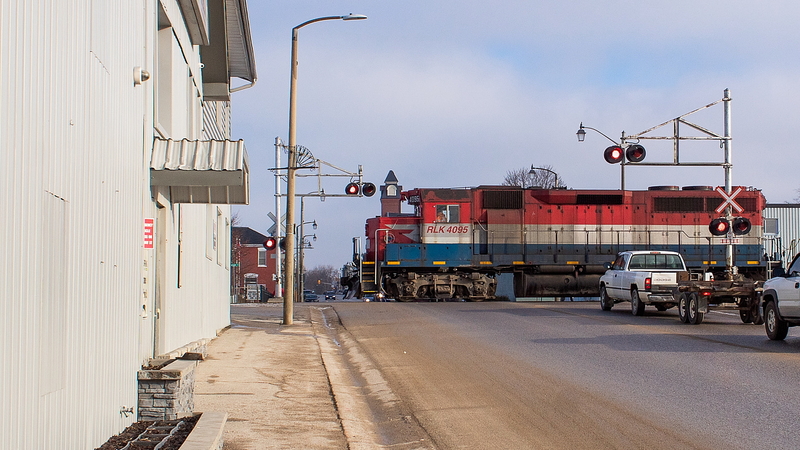 A little unsure what to do, and with the train nearing, I figured I'd at least try for something interesting so I put the wide angle lens on and scampered to the south side of the crossing. I am quite grateful the sun did come out for a bit, as it allowed for a nice shot at the Port of Goderich where they shoved one car down to the Port, which can be viewed here (along with a description of the day's operations). Good effort, nice to find something different and pull it off.